Take a step back — just a few decades — and you would find small, one-screen theaters at the forefront of many communities from coast to coast. During the early- and mid-20th century, they not only entertained residents, but also served as news outlets, particularly during World War I and World War II when they allowed theatergoers to witness the efforts of the boys overseas. And while these theaters are often small — especially when compared to modern-day, multiscreen theaters — for many communities, they hold a big collection of memories that span generations. However, in the early 2000s, it became obvious something was up at the King. “The roof had gone to heck,” Clough noted, adding people had also begun to notice viewings were occurring less frequently — going from everyday to four times a week before there were no movie showings at all. With this information, Clough said the city — led by Council Member Ryan Goodman — turned to the community in 2015, setting up a meeting at the local rec center to discuss courses of action. Sixty Ida County citizens turned up and overwhelmingly voiced their support for resurrecting King Theatre. That night they also collected more than $500 in pledges. Having community support and approval from the city council, a bid of zero dollars was offered alongside the promise to assume all liability for the theater building from the current owner. The offer was accepted and an 11-member board was formed to both preserve and operate the theater. 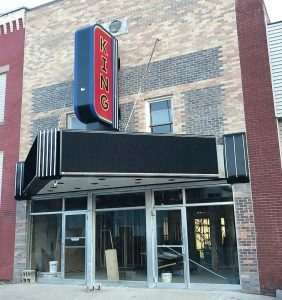 More recently, in November 2018, King Theatre has had new front glass doors and a bump-out faux ticket booth installed. It has also received theater seats, which were freighted in — with shipping donated by an Iowa trucking company — from Grand Rapids, Mich. 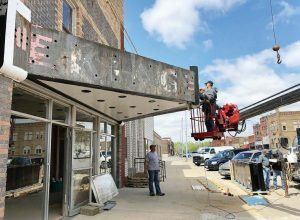 Throughout the process, the city turned to grants, including two from the Iowa Department of Natural Resources’ Derelict Building Grant Program and one from the Iowa Tourism Grants program. These grants helped fix the roof and spruce up the building’s exterior, which was sandblasted back into the state it was 40 years ago. 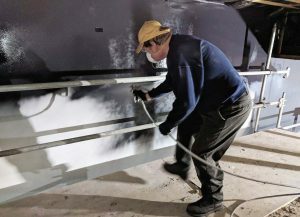 As part of the DNR grants, Ida Grove took great lengths to ensure everything was disposed of properly, protecting the environment from materials containing asbestos or other harmful components. 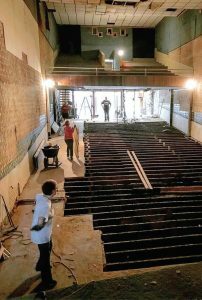 The community has also continued to support the project with a volunteer night this past October, which saw more work done on the theater’s flooring and projection room. 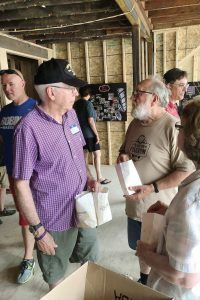 Past Odebolt Arthur Battle Creek-Ida Grove Community School District alumni classes have also gotten into the spirit, donating funds toward the renovation — their efforts chronicled on King Theatre’s Facebook page. “I couldn’t be more happy with how the project is transpiring,” Clough said. A touching moment came when Clough received a call from Newport Beach, Calif., from a woman who had worked at the King’s concession stand from 1951-56, starting when she was 12 years old. She had been following the city’s progress and shared her experiences working there, including the memory of putting her initials behind the counter. 1914 — Lee Horn opens Princess Theater in silent film era. 1917 — Frank King purchases and renames it King Theatre. 1940 — Owner Milton Mansfield adds marquee. 1954 — Theatre magnate Bob Fridley purchases the King, adding signature waterfall, floatin17g staircase, 100-seat balcony and tracked curtain. 1982 — Fred Saunders purchases the King during video era. 2010 — Building in disrepair and the digital equipment requirement leads to dormancy. 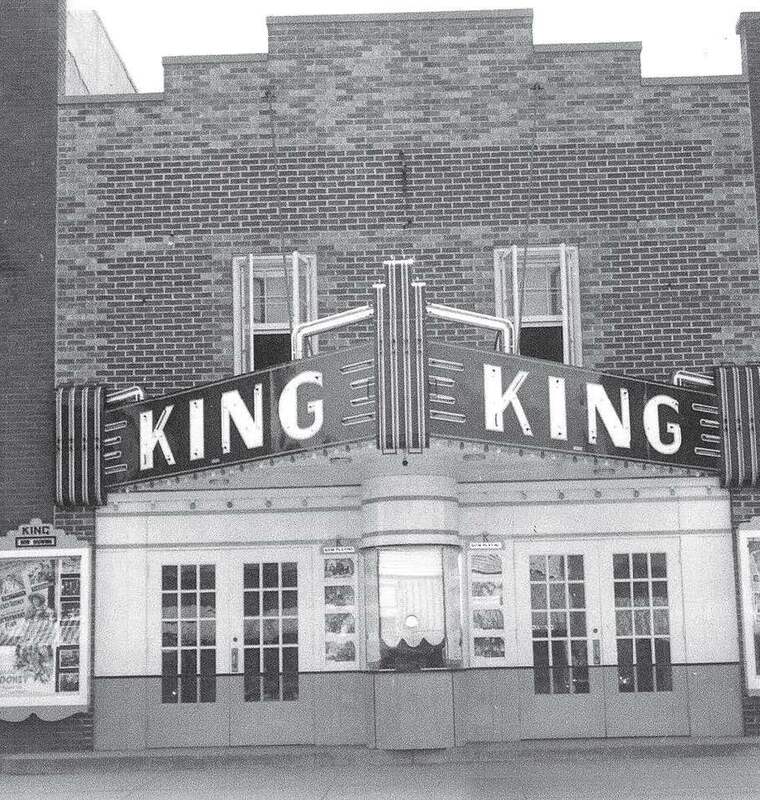 2015 — A meeting was held with the community to determine the fate of King Theatre. Ultimately, a zero dollar bid and agreement to assume all liability for the building by the city was approved. 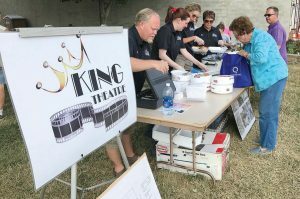 June 2018 — Heritage Days open house allowed members of the public to see the progress being made at the King.